Discover Garda Classico Rosso Superiore Dop red wine Privilegio, pearl of Valténesi. Are you looking for a red, intense, persistent, fine, fruity, spicy, harmonious wine? Privilegio has all these characteristics contained in a bottle. Garda Classico Rosso Superiore Privilegio Dop originates from the vineyards owned by the Azienda Agricola & Cantina Franzosi, located in Puegnago, in Valtènesi, a portion of the west coast of Lake Garda and its hinterland in the province of Brescia. It’s a famous land not only for the beauty of the landscape, but also for the production of wine and oil thanks to the special microclimate, particularly mild, and regulated by good ventilation. Here the moraine, calcareous soil, gives wines of excellent quality and structure, with intense and varied flavors. 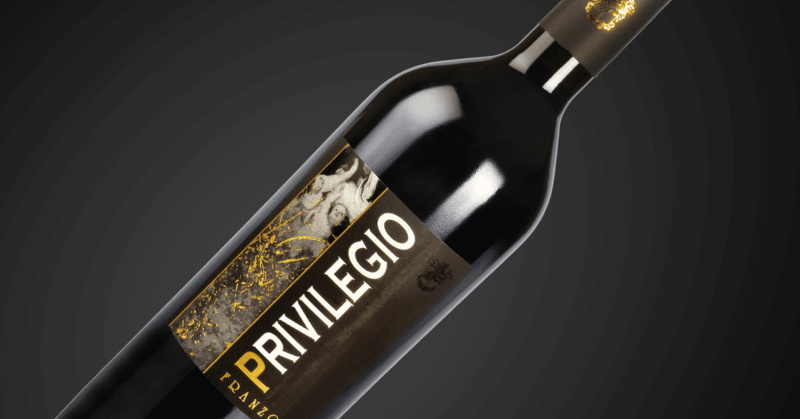 Privilegio wine is produced from the traditional blend of the best bunches of Groppello, Marzemino, Barbera and Sangiovese grapes, blended in variable percentage, strictly hand-picked in Franzosi vineyards. About 25% of the grapes are harvested surmature, favoring a drying in the plant: the clusters are left attached to the vine (the flow of the lymph is interrupted with a twist of the bunch peduncle) and left to dry directly on the vine for about a week. This process leads to a loss of weight of the bunches, allowing the evaporation of the liquid elements, such as water, favoring the concentration of sugars present inside the cells of the berry. In this way the wine is full-bodied, rich in alcohol and softer, with a wider and more complex organoleptic profile. After harvesting and manual sorting, the grapes are crushed and de-stemmed, and follows a long maceration on the skins. Malolactic fermentation is favored. In the first winter months the wine is decanted in French oak barrels and large 30-hectare barrel for about 24 months. Then it is transferred for a one year in steel and a futher year in bottle before the sale. Intense ruby red, almost impenetrable. Notes of ripe cherry, blackberry and dried plum are the backbone of its bouquet around which the sensations of carob, nutmeg and clove seem to whirl it, making it complex, elegant and intense. The entry into the mouth is crisp and compact but, at the same time, broad, juicy and deep. The fullness of the body finds its perfect counterpoint in the dense and silky tannins as well as the freshness compote; The finish is persistent, enveloping and with a very clean and very fine closure. The first vintage of Privilegio was bottled in 1998. Privilegio goes well with game, venison, rustic stews, wild boar, venison, goat goulash, braised beef short-ribs, and pot roast of beef braisedred meat, aged cheeses even alone as meditation wine. Pour the wine into the decanter slowly and steadily an hour before serving. Serve it at room temperature, using a large glass to collect all the aromas. Book now your visit to taste the Garda Classico Rosso Superiore DOP Privilegio, Click here.